When my father moved to Philadelphia last fall, I spent the weeks before his arrival decorating and setting up his new apartment. I decided to buy a skyline picture of every city he has ever lived in and frame them for his new place. I stumbled on ART.COM that helped me complete my project quickly and within a reasonable budget. As we all know, once you buy something online, you then receive your daily wake-up emails from them about their sales, what’s new, what’s hot, blah blah blah. I didn’t realize that this site actually DOESN’T flood your inbox until last week when I did get an email from them. Since I am not automatically programmed to delete their emails (attention Bath & Body Works, Target, Macy’s, Babies R Us), I read the email and clicked through to their site. I found a pretty cool feature called “My Galleries” where you can save art work that you like. You can even choose to “View in a Room” with choices of Living Room, Dining Room, Bedroom, Entry Hall, Office, etc. I found this really helpful when choosing the size of a painting. It was great to see , ok that’s how big it will be over a loveseat, or a dining room table with three chairs on one side. This is a picture that I recently acquired when cleaning out our childhood home. How do you think my room is coming along so far? I choose different frames but in the same gold metallic color family. I was having so much fun; I decided to start another room! I could do this all day, even though I know nothing about art! One of my sisters is an Art Historian and a curator at a museum. I wonder what she would think of my little collection here! I simply go by the feeling if I like it or I don’t. (Maybe I like umbrellas?) I was quite young when my mother first hung Renoir’s Les Para Pluies in our dining room. I used to sit and just look at it. Since Olivia has started watching Nick Jr, I love the videos called I Love Art where the children visit The National Gallery and tell a story of what they see in a famous painting. The latest one shows two girls talking about “The Umbrellas” by Pierre-Auguste Renoir! What are some of your favorite paintings or artists? What pieces of art do you have in your home? Leave me a comment and let me know. I like to buy local artist pieces (very small or “priced right”) when I visit places. 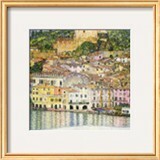 A favorite piece is postcard sized water color of The Bridge of Avignon. I bought it from the street vendor artist within eye view of the bridge. Right now my favorite are family photos from the late 19th – early 20th century that I spent all day Saturday at Michael’s frame sale buying frames for them! Good point about the umbrellas, Maureen! As you know, I am married to someone trained as an architect who prefers windows to pictures, but I manage to get some things up on the walls! Buying local is a good idea. One tip: have a look at art schools near you–they often have student sales to raise funds for the school.